Using the vertical plane for planting offers the opportunity to make the most of the space in your garden. Living walls and vertical gardens are increasingly being used to beautify walls and offer more space for display and production. Knowing how to create a living wall and vertical garden is especially useful in small gardens, courtyards and balconies, to use every perspective. You can simply attach pots on the wall or opt for a range of systems with pockets or automated hydroponics. For maximum drama, a full living wall is stunning, or in limited space you could plant your own growing art in a picture frame, create a tower of stacked pots, or use climbing plants for a cascade of colour. Read on for tips on creating a vertical garden, and don't miss our guide to designing a garden to ensure the rest of your space is just right. What's the difference between living walls and vertical gardens? Simply put, living walls are often created with modular systems fixed to a wall; they can cover a whole wall or a small section. Vertical gardens take a more traditional approach, using everything from pergolas to containers to use the vertical plane within the garden. Let's take a look at living walls first. What do you need to create a living wall? The range of commercially available green wall or panel systems may seem daunting, but in general they are either soil-based modules, soil-based fabric membranes or hydroponic systems that rely on water and fertiliser fed to the plants from a tank system. Keep in mind the weight of the system and strength of your garden fence or wall. You will need a waterproof membrane or a gap to protect the wall behind. You may opt for an irrigation system, or hand water; just make sure it is even, as the plants at the bottom tend to get a larger dousing. Where to plant a living wall? You can site your living wall or vertical garden anywhere – the trick is really to choose the right plants for that part of the garden, just as you would a border. Is there a shady spot that would be transformed with lush, shade-loving foliage, or a sunny area for a herb tower? It may not be a whole wall you want to transform, but rather you’d like to add a decorative touch to a space or a mini edible garden by the kitchen. These miniature works of art can be created with fabric pockets and plastic container modular systems that you can buy or you may like to make your own frame. Your green living wall will change as it grows, can be redesigned easily by adding different plants, and is often portable. Use long-living, disease-resistant plants that are light with shallow roots, as they will have restricted root space. For a year-round effect select mostly evergreens, then highlight with seasonal colour. You can grow edible treats, pretty flowers and foliage; your imagination is the only limit. Edibles need a sunny spot – herbs, strawberries, tomatoes and salad leaves all do well vertically. For sunny ornamentals try helianthemum, sedum, daisies, euphorbia and festuca. Choices for shade include ferns, bromeliads, ajuga, heucheras and tiarellas. The vertical plane is the longest axis in the garden, and there are other ways to use this often forgotten space. For millennia we have used climbing plants to green a surface or espaliered fruit against a warm wall. Arbours, arches, tunnels, trellises and pergolas can become lovely focal points adorned in profusely flowering roses entwined with clematis. Another easy way to include vertical interest is to add some hanging baskets or containers on windowsills, balconies, along walls or displayed on stately plinths or a theatre stand. Your walls and fences can become an attraction in themselves through paint techniques, planting schemes, creative materials or adornments. 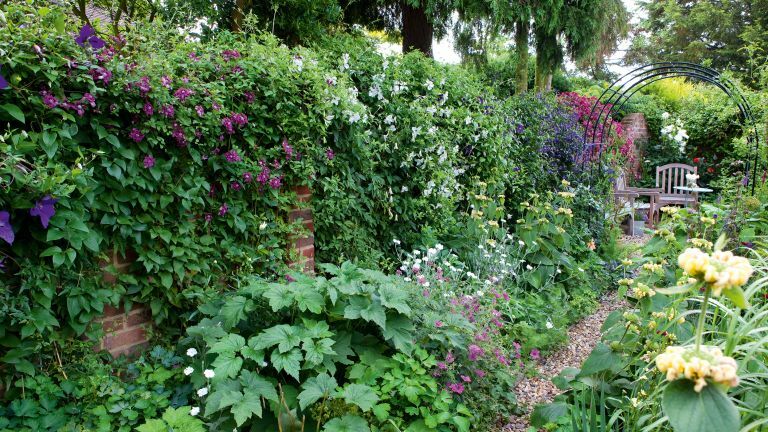 Screens and hedges also offer further opportunities for your creativity, from a recycled old bed frame – perhaps to support plants and screen an area – to a tapestry of a mixed shrub hedging. Tripod structures have long been a valuable tool in the garden to add vertical punctuation points and support plants. A splash of paint will transform them into something special. Once you really look at the vertical axis you may be surprised at just how much you can achieve to complete your garden’s vision. So look up, and grow up! As elsewhere, select plant varieties to suit conditions, whether annuals and perennials or edible choices, for shade or sun. Right plant, right place is important; remember that the plants above will overshadow plants below, and will need careful watering, feeding and pruning. Living walls are planted more densely than a garden bed; think of them as containers in the sky, a tapestry of colour and form. Find out more about choosing plants for your garden with our guide. Pachysandra are evergreen perennials or subshrubs with leathery leaves that grow in all but dry soils in part or full shade. Hardy and drought-resistant once established and pest and disease free. Tiny white flowers in mid to late spring. Heuchera offer a range of foliage colours and spires of tiny flowers. Clump-forming perennials that tolerate some sun but prefer part shade, in moist but well-drained soil. Tidy up dead leaves and if vine weevil is a problem switch to heucherellas. Vinca minor or periwinkles are tough, fast-growing evergreen perennials for shade or part shade. Violet blue flowers from early spring to mid autumn. Grow in all but the driest soils. Erigeron are invaluable for their profusion of tiny daisy flowers from May to November. Happy in sun or part shade, easy care, grows in walls and cracks in paving. Bees and butterflies love this plant. Pelargoniums are tender bedding plants, ideal for containers in a full sun to part shade spot. Usually grown as annuals to add bright colour to the greenery in summer. Water moderately. Some varieties are scented for added interest. Gaillardia are short-lived perennials that add bursts of fiery flowers through summer to autumn. Buy as a plug plant. They need well-drained soil in full sun, are very soil tolerant. Butterflies love them. Thyme is an evergreen subshrub herb of many different varieties, all have tiny aromatic leaves and flower in summer. Easy care and disease free. Grow in full sun in well-drained soil. Marjoram grows best in full sun in well-drained soil and is tolerant of most conditions. Harvest the leaves before flowers appear or they taste bitter. Strawberries have to be everyone’s favourite fruit to grow and they work well in towers, hanging bags and vertical gardens. They need a sunny, sheltered spot, fertile, very well-drained soil and organic matter added. Hops are not just for beer; they are a great hardy climbing plant for gardens and will grow anywhere. Not a vine but a bine because they twine clockwise around a support rather than sending out tendrils. Plant rhizomes in humus-rich soil. Laburnum creates a spectacular sight when the golden racemes hang down in late May/early June. They need a well-drained site with light soil and the classic combination is to grow purple alliums underneath. A note of caution – don’t plant where children play, as all parts are toxic. Honeysuckle climbers prefer moist, well-drained humus-rich soil in a sunny spot. The more sun, the more flowers, which are also attractive to beneficial insects and are deer resistant. Keep well watered and mulch to preserve moisture. Growing vertically offers many possibilities to grow both ornamental and edible plants. Living wall systems include anything from simple grow-bags and panels available from garden centres to ones installed by specialist companies. You can build a living wall on any solid wall or fence. Useful to camouflage ugly walls or structures, insulate the house and increase biodiversity.